Brendan McMurphy graduated from Washington State University with a Master of Arts in Music with a Jazz emphasis and a Bachelor of Music in Trumpet performance, but requires no stunt double when it comes to his second instrument, the drums. An intuitive and musically sensitive musician with persuasive rhythmic and harmonic concept, Brendan is well versed in both jazz and classical performance as well as many popular forms. His composition “Somewhere, Someplace” was featured in the Fall 2009 edition of Jazziz magazine. He also co-wrote the theme song and soundtrack music for “The Last Chapter”, an independent short film. 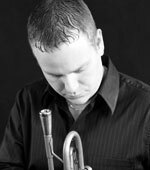 He has performed with the Washington Idaho Symphony, in addition to various Jazz big band & small group jazz combo settings throughout the Pacific Northwest. He is currently on faculty at Holy Names Music Center, where he runs “The Jazz Factory” a weekly class teaching jazz performance skills to a small group of High School aged students.